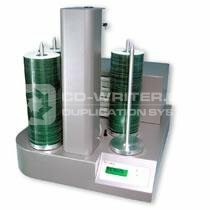 The CopyDisc 4 XC delivers easy to use, fully automated CD and DVD duplication solutions. This standalone or networked copier combines a small footprint with a reliable metal framework construction, which means that it is built to perform 24/7, it will also fit comfortably within any environment, be it an office or a professional production facility. The CopyDisc 4 XC is fitted with the very latest industry-leading CD-R or DVD ±R drives offering high-speed duplication of up to 660 discs at a time perfect for overnight, unattended disc publishing. CopyDisc . 4 . XC . 660 . Copytrax .